The current government shutdown is the economic equivalent of a self-imposed natural disaster. As the 32nd day of the longest government shutdown in our history continues, we find that it has cost the economy about as much as the average hurricane. Using the Council of Economic Advisers' estimate of a weekly loss of 0.13 percentage points of quarterly Gross Domestic Product (GDP) growth, we estimate that the four weeks of the government shutdown has cost the economy about $26 billion. Based on estimates from the Congressional Budget Office (CBO) of the economic cost of hurricanes between 2000 and 2015, this harm almost equals the $27 billion average economic toll of a hurricane (converted from 2015 dollars to 2018 dollars). This does not include the more recent hurricanes, for which we cannot obtain data because the National Oceanic and Atmospheric Administration (NOAA) website is currently shut down. 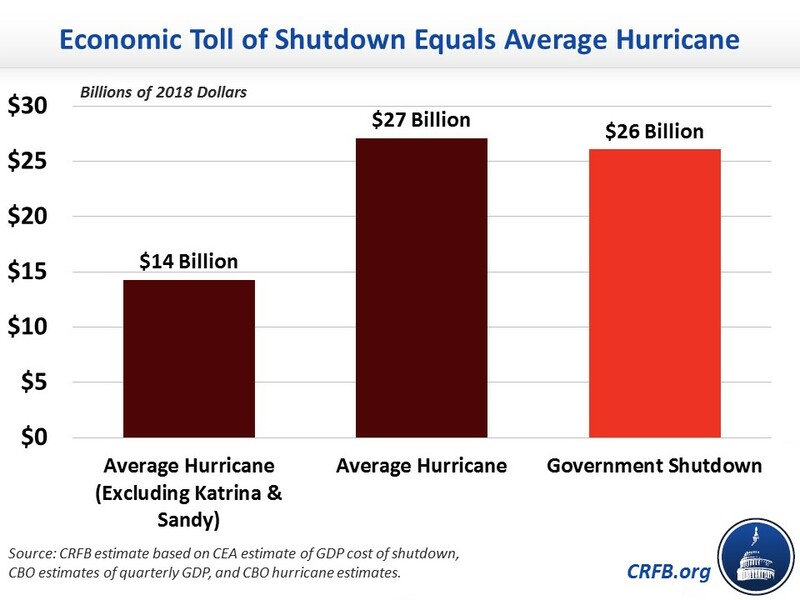 Taking out the two largest hurricanes – Hurricane Katrina in 2005 and Hurricane Sandy in 2012, which were outliers in terms of economic damage – the average cost would be less than $15 billion, meaning the current shutdown has cost the economy almost double the average hurricane. This shutdown has gone on too long and, as CRFB president Maya MacGuineas put it, "the current government shutdown is an embarrassment." Lawmakers and the President need to come to an agreement soon to reopen the government and stop hurting our economy, and they should do so without further worsening our unsustainable fiscal situation.